2013: Breakout Year for SUP? Paddlers compete last month at Benderson Park in Sarasota. ORLANDO – Surf Expo, the semi-annual trade convention that converges here at the Orange County Convention Center, perhaps should be renamed SUP Expo. 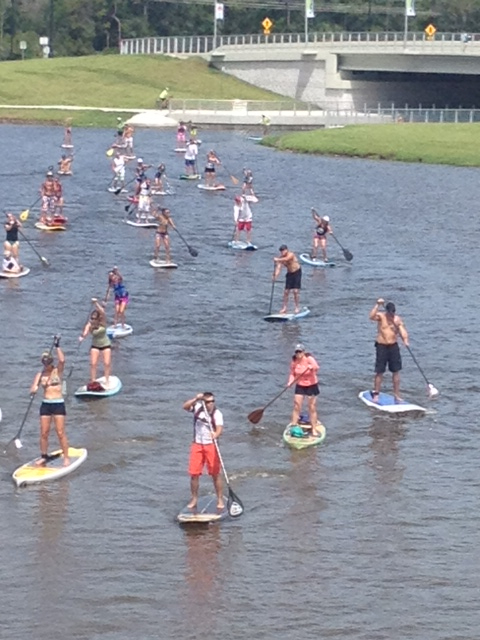 Everywhere we looked on Saturday, stand-up paddleboarding dominated the scene. There were two dozen board manufacturers, more than double the amount from just two years ago, and only a fraction of those represented on Thursday during SUP Demo Day at a nearby watersports facility. Perhaps the coolest product we saw was the Nocqua 2000 LED system, LED lights that go on the bottom of a paddleboard that light the water below, enabling the paddler to go out at night. (We’re hoping the $399.99 price tag comes down over time.) Even products such as the DryCase and the GoPro Camera, though not SUP-specific, seem made for the sport. SUP Expo – er – Surf Expo is just one sign of the phenomenon. When I got my first board early in 2011, the sport still was catching on here in Florida. Even though my Paddle Fit co-author Brody Welte had launched a successful SUP business in St. Petersburg two years earlier, I still got odd looks out on the water and occasionally had to explain what I was doing. These days, it’s impossible to drive for more than an hour in Central Florida and not see a paddleboard strapped to a car. I counted at least two dozen paddleboarders out on the Dunedin Causeway Sunday afternoon. It wasn’t that long ago where I would have been one of only a few out there dodging boats and jet skis. Attendance at SUP races, though still modest compared to running and triathlon, has increased significantly. Benderson Park, the new $40 million, man-made watersports park in Sarasota that has hosted several SUP events, is tailor-made for the sport. IT’S THE BEST WORKOUT EVER: If you want to see some seriously jacked physiques, watch the elite division of a SUP race. SUP combines core training, balance work, and rotational movements. It’s like working out on a giant BOSU ball. Plus, there’s perhaps no better cardio workout than doing intervals on a paddleboard. Find a few buoys, crab traps or other markers in the water and alternate between sprinting and paddling at a relaxed pace. There are SUP Pilates and SUP yoga classes, which are more fun (and definitely more challenging) than traditional yoga and Pilates. IT’S MORE BADASS THAN KAYAKING OR BOATING: I’m often paddling when some jerk in a six-figure boat flies by way too fast, with a beer in one hand and his bloated, sunburned belly jiggling in the breeze. I’ll think of all the money and effort it takes to experience a day on the water like that. Nothing against boating – and I’m thankful for my friends with boats – but SUP is a more enjoyable, less expensive way to spend a few hours on the water. SUP often is compared to kayaking – or at least a hybrid of surfing and kayaking – and that’s an accurate analogy. But sitting down doesn’t produce the same experience as SUP. You don’t see as many sea critters or get as much of a workout. IT’S SAFER: Like any watersport, SUP can be dangerous. I prefer to paddle on weekdays since there’s less boat and jet ski traffic. For a while, paddlers resisted life jackets and leashes much like some motorcycle enthusiasts won’t ride with helmets. But there are plenty of small, lightweight personal flotation devices that fit around the waist and these days even experienced paddlers wear them. (If you can’t swim at least a quarter-mile in open water, you should definitely be wearing one.) Unlike cycling, where any fall is going to produce at least road rash, falling off a paddleboard will just make you wet. Unlike running, you’re not pounding your joints into concrete or asphalt hundreds of times an hour. WOMEN ARE EARLY ADAPTORS: Women drive the popularity of anything. Triathlon boomed six or eight years ago when more women got involved. More recently, we’ve seen the same phenomenon with half-marathons and obstacle races and it’s also fueling the growth of SUP. Women tend to be more adventurous and have better balance than guys, who worry that they’ll fall on their butts and look foolish on paddleboards. (SUP actually is much easier than it looks.) This is true of females of all ages. I’ve introduced a number of kids to SUP and inevitably the girls get it faster and show more patience as they learn. Most importantly, women control household budgets. A quality board starts at $1,000 and paddles in the $150 range. That sounds like a lot, and it is, but road and triathlon bikes cost more and require far more maintenance. Heck, avid runners spend $1,000 on shoes every two or three years. Boards can last indefinitely. Two years ago, it seemed SUP would be a niche phenomenon. Now it seems like everyone is looking to take a stand.